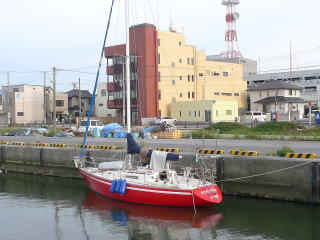 Just after the high surf advisory was lifted, I left Nakaminato Port and sailed for Choshi Port. 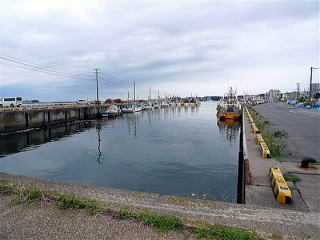 As Choshi Port is safe even with a typhoon, fishing boats gather here for cover either. 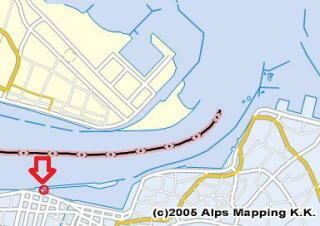 Then, as many ropes are laid to fix the fishing boats across the port, you can’t even get into the port. 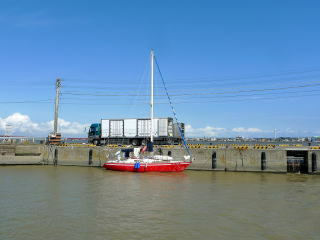 I sailed into the port, because a friend at the port had told me that I could still managed to get into the port at that time even with many fishing boats waiting for the typhoon to pass. Passing by the white lighthouse at 35 45.170N　140 51.670E on your left, you will see another white lighthouse on your left and a red lighthouse on your right. Moving through between them, you will see another read lighthouse on your right. Move west all the way along the training wall breakwater. There is a cut with a red lighthouse in the middle. Move west further. The berth is at the innermost dead end. When you approach the port from south, as there is a long breakwater, it takes time to find the white lighthouse at 35 45.170N　140 51.670E. It comes into sight after you reach close to “CHOMA2” 35 43.800N　140 54.200E waypoint on my Google Map. Turning around the white light house, you move in behind the breakwater. You will see another white lighthouse on your left and a red lighthouse on your right. The berth is at the innermost dead end. When I came here in 2009, three sail boats were mooring here. Now, here is vacnt with no boat. You moor alongside to the north side or the south side quay. 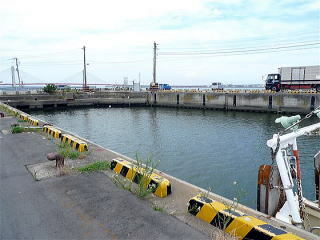 The berth is close to Choshi Station, just 10 minutes away. There are many restaurants around here. New toilet with bidet functions has been built at a park two minutes away in front of the berth. There is a water tap at the park. A big coin laundry is five minutes away. Walk east along the sea, go over a bridge, and turn right. It is at the premises of a cake shop “Chateraise”. “Matsu no Yu” public bathhouse, which has a coin laundry on the second floor, is ten minutes away. Walk east along the sea, turn right at “Lawson” convenience store, walk further, cross an avenue which has “7/11” convenience store on the right side, pass by a taxi company and turn left. It is the fourth house. TAIYO is a very large shop with variety of selections for provisioning seven minutes away beyond Choshi City Hall. Reasonable prices, especially with fish. Choshi Select Market is a shop for local promotions five minutes away. Near, fresh and low prices. Two fuel shops are five minutes away before the bridge. Walk along the sea. Many boats stay here and leave Japan bound for east.